So, the daughter woke up and was really bummed out that she had missed the Werewolf and other late night activities, which is a big draw for someone who normally has a pretty strict bedtime. The Empire won the Battle of Yavin, crushing the rebellion with one fell swoop. The moon of Yavin IV, the secret rebel base there, and the entire revel leadership are now space dust. The Jedi were also destroyed. Luke Skywalker and Princess Leia, Anakin Skywalker's offspring, died in the battle. Yoda, in hiding on Dagobah, felt the disturbance in the Force and gave up hope. There is no rebellion. There are no remaining Jedi. There is only fear. The DEATH STAR, under the command of Grand Moff Tarkin, is now enjoying a victory lap, "addressing" planets that were sympathetic to the rebellion. First he had us create world names on separate index cards. We each created one, ending up with: Zokbar III, Casis-7, Tobiotic VII and Tobiotic VIII, and the Planetoid of Dree. We drew random cards for the biosphere for each one (swamp, snowy, volcanic, jungle, city), and the government structure (crime lords, theocracy, tribal, monarchy, dictator). There was also another index card with the death star ominously pictured on it. That sets the frame for the story, but now we dived into a specific planet: Zokbar III, the swampy planet ruled by crime lords. We collaborated on a few things, and decided it wasn't any Hutts, but instead some other competing faction. We then each got an index card to create one character apiece. The task was simple and consisted of defining 3 things: A name, a role, and a secret. Whether the individual characters survive or not is up to the players and the direction of the narrative. It's totally possible that some drama plays out and everyone just dies... or that some people jump into an escape ship and take flight just before the blast (again, totally Star Wars). Also, for each planet in the narrative, there is a chance the death star will be destroyed. The only mechanic consists of rolling a d6 after each planet scene, so see who gets destroyed. The first planet has a 5 in 6 chance of blowing up (and there is inversely a 1 in 6 change of the death star biting it). The second planet goes 4 in 6 vs 2 in 6, and so on. Because there are five planets, there is the possibility that the death star survives the movie, and that the Sith win the day, and a follow-on movie would be required to see this through. We had such little time to play this, but it's definitely easy to set up, easy to jump into, and easy to run. I'd definitely have this in the back pocket for an easy story game to play with Star Wars fans, or at any RPG meetup. I think I would house rule it that the probabilities are reduced slightly further, where the first planet will definitely die, the second has a 1 in 6 chance, and so on. That means the final planet still only has a 4 in 6 chance of winning. The stakes feel a little more grim, even though you will likely win sometime during the narrative. From a distance you'd think we were playing Microscope! Because of Nova's friend Anakin's birthday, I originally had decided I'd run a kids game for him, his 2 friends, and the daughter. HOWEVER, my friend Gina was open to running Dinosaur Princesses, a kids RPG I believe is being designed by Hamish Cameron. Even though we've gamed together, I've never gotten to see Gina GM before, because she's just jumping back on to that particular horse. She was seriously fantastic, both as a GM in general, but also in being able to manage that table of kids. Two were super quiet, two were very loud and energetic. It took some serious skills to keep it flowing so smoothly, and I was very impressed. The character sheets are dinosaur types (Tyranosaurus, Pteradactyl, etc.) and look like pages from a coloring book. There are a few fill-in blanks for name, role, and skills. It's all very open-ended, and up to the kids imaginations, which is an aspect I immediately respected and approved of. Another aspect of the game is the drawing map. 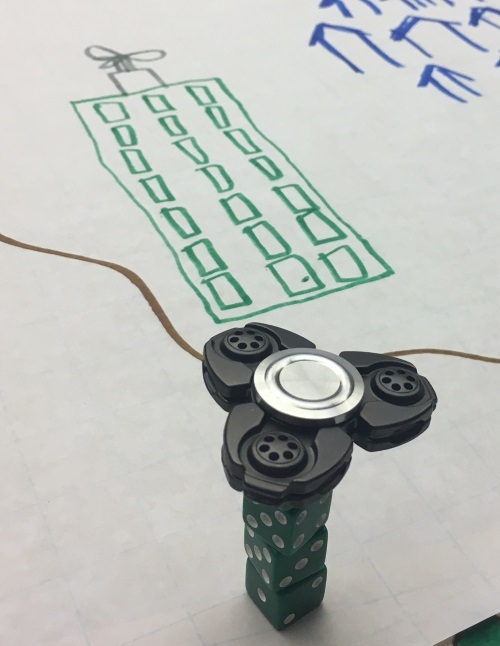 A huge roll of paper was rolled out across the table for everyone to draw on, and a colorful selection of markers was provided. Each kid got to draw their little home base, which ended up including a volcano, an adventurer university, and a waterfall paradise. And then the GM gets to start drawing things in the middle, that include all the various complications and adventure hooks, many of which are spawned from the minds of the kids playing. Four corners of dinosaur homes, and a large island in the middle. A table filling up with complications and problems, including a crazy lava flow heading to the village, yikes! Player dice ranging from 1-3 looked like complications to their problems, and 4-6 signified successes in overcoming GM issues / dice. I'll try to get more information on this later, as I was also running about, checking out of the hotel, and so on. One of my favorite parts... Anakin built a dice tower with a spinner on it. Another player mentioned "dicescraper" as a pun (genius!) Gina took all this and ran with it, and Anakin drew a flying skyscraper, which ended up being a focus in them solving their issues. A closer look at the final map, with complications that arose, and crossed out as they were solved. The game was awesome. It ended up running just around or under 3 hours, and the kids were engaged the entire time. I am so happy Gina ran this. I'll also add that she advertised it, at the beginning, as "Dinosaur Princesses", and despite my hesitation that this would turn off the boys (and to maybe advertise it as gender neutral), I'm glad it was advertised how it was. Two of the boys made a comment or two in the beginning to the effect, and crossed out "sses" to make "Dinosaur Prince" on the sheet, and Gina also mentioned that the dinosaur's gender could be whatever you chose it to be. But I'm sort of leaning towards a game that doesn't apologize for the title, and just owns it. EDIT: Gina talked a bit about this on the Happy Jacks RPG Podcast (season 19, episode 11). By game end it was just after 1pm, and after eating lunch with the kids and parents, we said some goodbyes, did a little wandering, and then headed home. All in all, a very successful con, and I can't wait for the next one... Strategicon Gateway 2017.